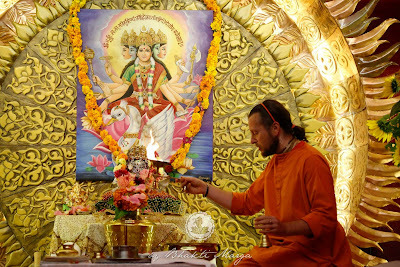 This year's Gayatri Yagna was a wonderful 24 hours full of beautiful prayers. 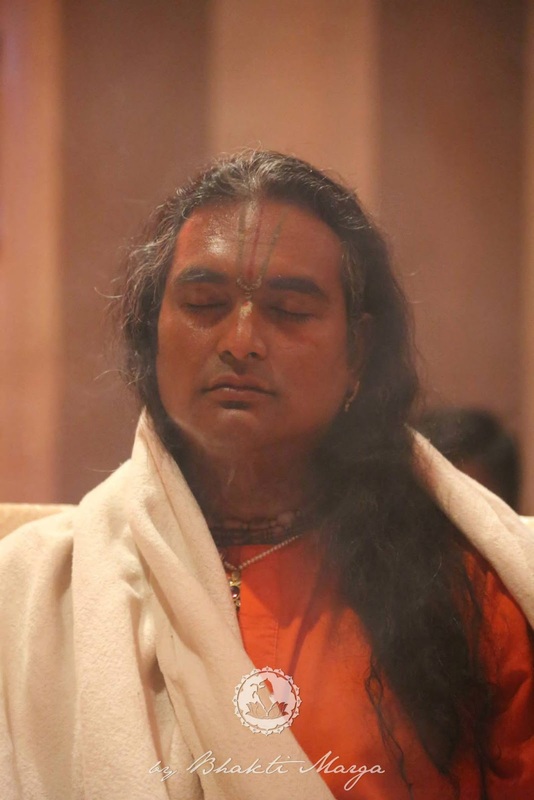 The event began early in the morning, with Sri Swami Vishwananda speaking about the Gayatri mantra itself - not about its origin, as he'd spoken of in previous years, but of its use: how to chant the mantra properly, and how it benefits the spiritual seeker. 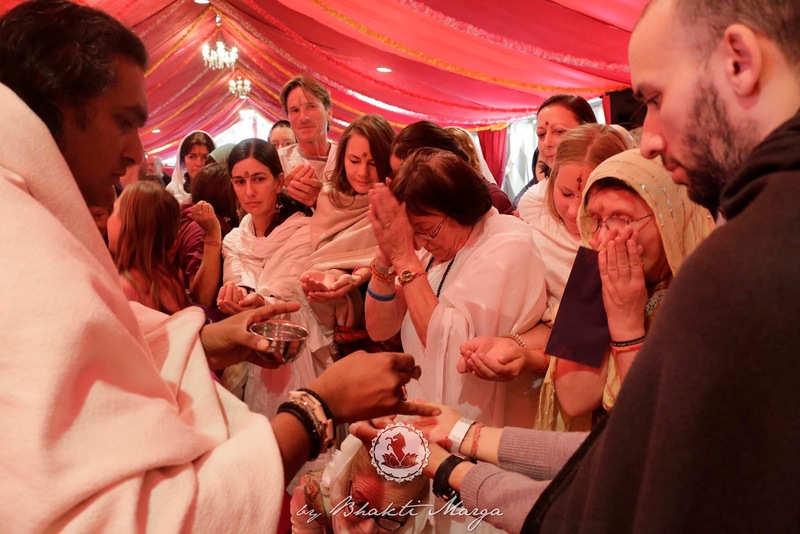 At the end of the yagna, many devotees offered a coconut to the yagna kund in front of the altar, symbolizing the surrender of our mind and its negativity to the Divine, so that we can realize who we truly are through the Grace of God. The next time Shree Peetha Nilaya puts on the 24-hour Gayatri Yagna, you should definitely do your best to go! It is said in scripture that the Gayatri Mantra is the Mother of all mantras. All other mantras lie within the Gayatri Mantra. Guruji noted that in the Gita, Krishna said, “Among all the mantras I am the Gayatri Mantra.” The four Vedas reside within the mantra itself. It is incredibly powerful--with the ability to give the full knowledge and wisdom--the embodiment of the Four Vedas, purify and liberate a soul. Gayatri is Mother of Vedas. It is destroyer of sins. There is no other Mantra more sacred and purifying than Gayatri Mantra on this earth as well as in the heaven. 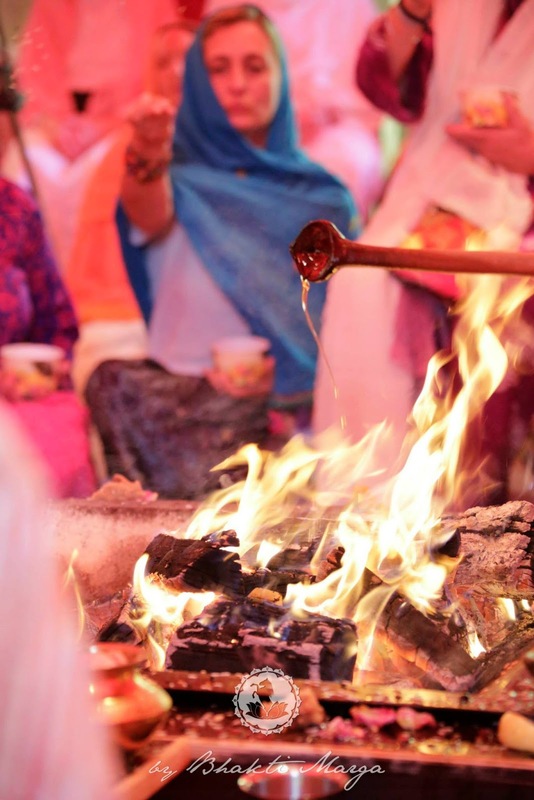 The opportunity at Shree Peetha Nilaya’s 24-hour yagna is special. 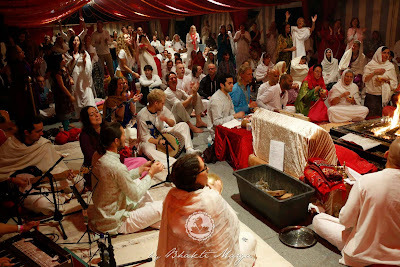 A whole 24-hours' worth of chanting can be extremely tough, but here, at the ashram, it could not be more fun! The facilities are comfortable when you need to rest and relax before going back to the intensity of the celebration. 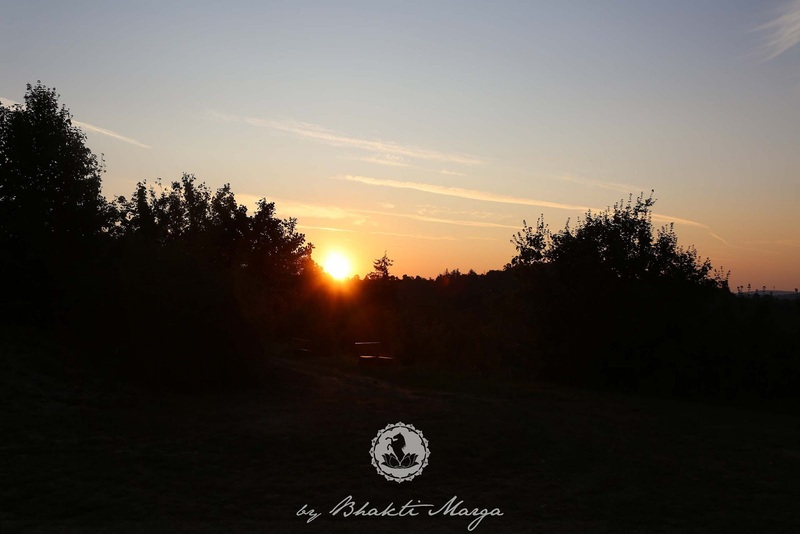 The atmosphere of the ashram is unique itself, giving the proper uplifting energy to sustain the residents and guests. Once you begin to recognize the gift and power of the Gayatri Mantra, combine its effect with the energy of the ashram, the deities, and the presence of a spiritual master, one can see how incredible an event like this really is. Sri Swami Vishwananda came to the yagna fire several times throughout the event. Waking early the first day, puja began at 6AM to pray for the grace of the lineage, and to thank it. 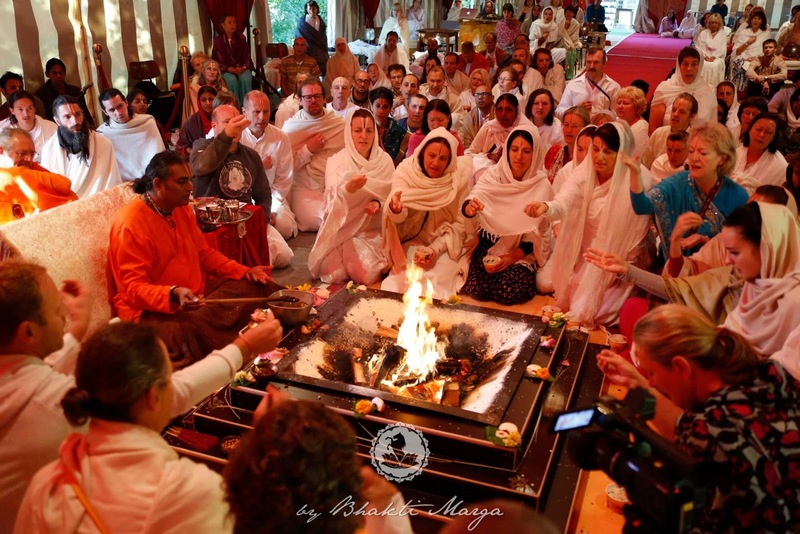 The yagna was lit around 8 AM. Rotating in and out, residents and guests all took turns offering a mixture of grains - hawan samaghri - into the fire. The collective effort allowed for this kind of event to take place. 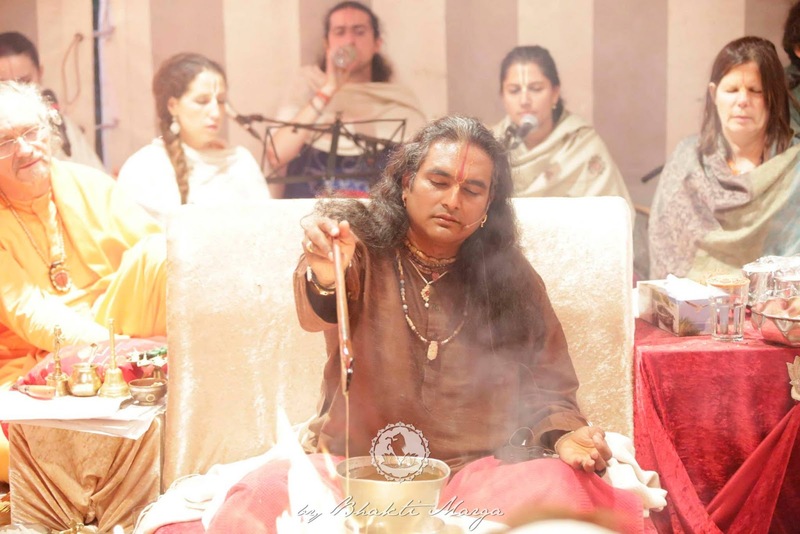 Musicians rotated in and out, and swamis and rishis alternated leading the yagna. Guests were able to freely move in and out of the event tent. 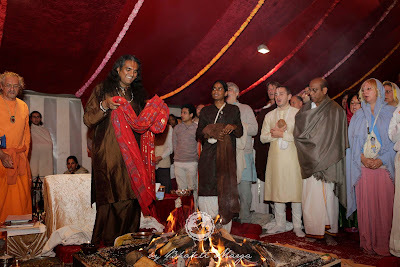 Everyone had the opportunity to offer alongside Guruji. The festivities went from around 6AM to 9AM the following morning. The music was a wonderful addition to the chanting! It is important to stress how these events at SPN can be life changing. So often, participants have experiences with the divine in ways they could never predict. “What was unique to me is that we were able to sit at the kund for lengthy times. Rather than for a specific count, during the 24 hours we had the freedom to stay and go deeply into the chanting and offering. Most yagnas celebrations don’t necessarily offer this. I experienced this for the first time. ‘Oh we will not do the normal way’ Guruji said regarding the offering circle. ‘Sit as long as you want, a few minutes, one hour, whatever. Just change to what you feel.’ This provided a freedom of dialogue with Gayatri Ma. You could develop a relationship with her. There were no conflicts with the changing times. The party was still rocking, even late into night. A devotee had some very sweet words about the celebration. 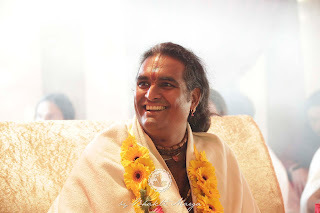 “Each and every time you say the Gayatri mantra, it was like saying thank you to Guruji. 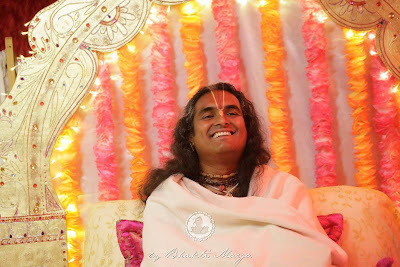 Each repetition was like saying I love you to guruji. It’s a grace just to know the gayatri mantra. She was allowing us to get to know her better. The sangha was so special. Everytime we got tired, someone came to cheer you up and brought energy to sustain the chanting. It’s like a metaphor for our spiritual path. 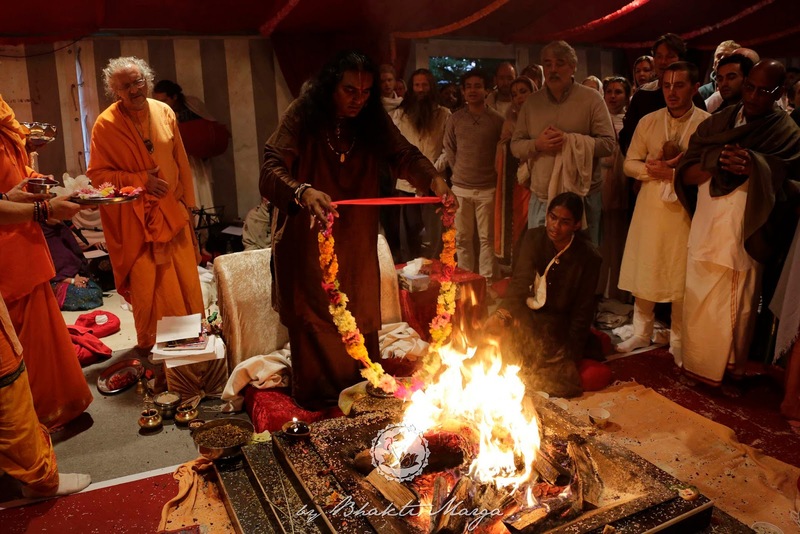 There was a beautiful ending to the yagna. Guruji then led a sweet puja and arati. 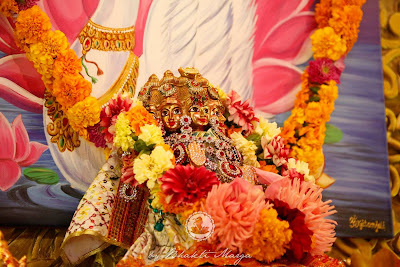 He blessed us, sprinkling all with holy water from Kalash Puja, and gave everyone Prasad water offered to Thakur. Curiously, the water from Thakur was scarce, but seemed to continually manifest, serving over 200 people out of a small dish. Sri Swami Vishwananda dresses Gayatri, as She is manifest as the holy fire. Guruji gives water to over 200 people of a small dish. The long event was a chance to test one’s willpower and discipline. Inspiring each other to enrich the experience, everyone helped to elevate the energy. It was this collective sensation, this state--unity--which helped push personal limits in this 24 hour endeavor. Testing their will, strength, and endurance furthered people on their spiritual path. 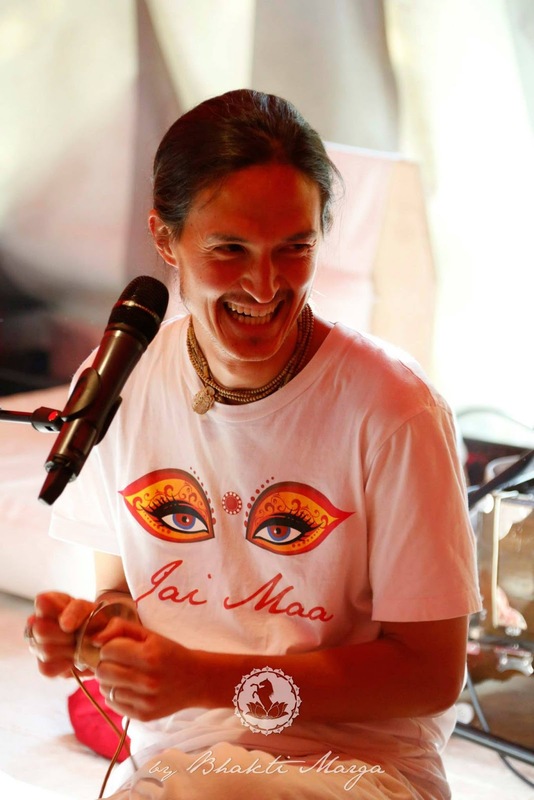 It built beautiful relationships with Gayatri and aligned more with Gayatri’s divine vibration. It developed one’s own abilities and deepened awareness into the Self. Thank you Gayatri Devi! 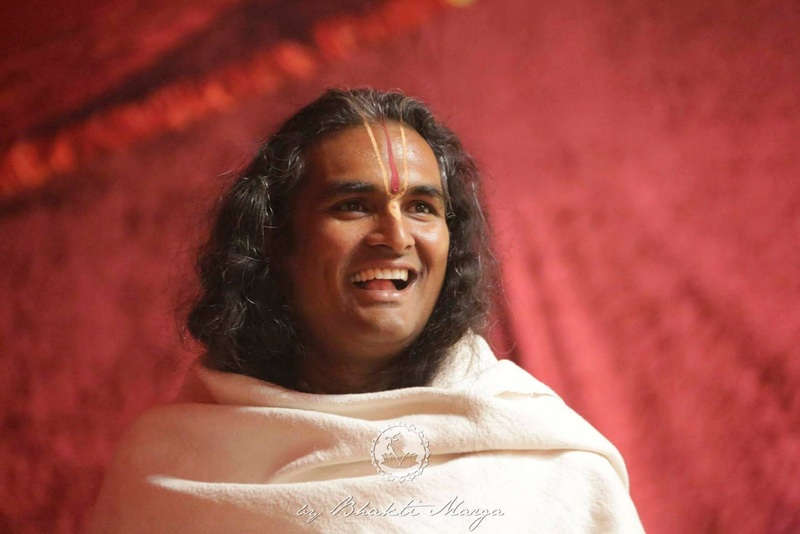 Thank you Guruji! Jai Gurudev!